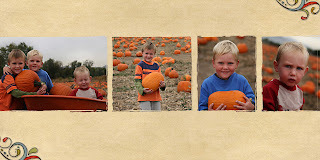 These are some pictures I took of my sister's adorable boys, so I thought I would play and make a storyboard out of it. Yeah! You are back in the bloggosphere. I had almost given up on checking your blog. Very cute pics. Love the pumpkin ones and the new header. Nik, Your talent never ceases to amaze me. I love luke's face in the first picture, halarious!